This post is inspired by my sweet friend Dani. I know these days are fleeting and the memories of my daughter's babyhood and our first months of new parenthood are quickly escaping us. I know that, though mundane, I will appreciate this documenting and the ability to read back on the little parts of our days together. That's what this space is for, after all. Right now is for spending nearly all of our time together as three. It is for work schedules that coincide perfectly and allow us to begin each day with each other. It is for sleeping later than we should, and staying up later than we should with delirious laughter and ice cream pops from a local natural sweets shop. (I may jinx it by writing it out here, but Anabel has been sleeping from 8 at night to 8 or 9:30 in the morning.) So, right now, is for starting our mornings slow. After the sun rises and stretches itself through our curtains, Anabel will join us in bed to nurse. Steven and I cook breakfast together while our girl runs laps at our feet. She brings us all of her magnetic letters, one after one, and tries to make the sounds for each excitedly. These mornings are for delicious local eggs, 7-grain toast with coconut oil and raw honey, and perfectly ripened creamy avocados. Sometimes I will juice produce that is on its last leg. These mornings are for Anabel's ability to eat several bananas and nearly an entire avocado if we will let her. Right now, is for choppy baby bangs, cooler weather, the deepest belly laughs, dancing on the balcony, and the ABCs being sung over and over again. It is for Anabel recognizing fourteen letters, and finding them in books and road signs when she sees them while we are out. It is for our girl exclaiming "NANA!" when asked her name; not to be confused with banana which is "NANANA." 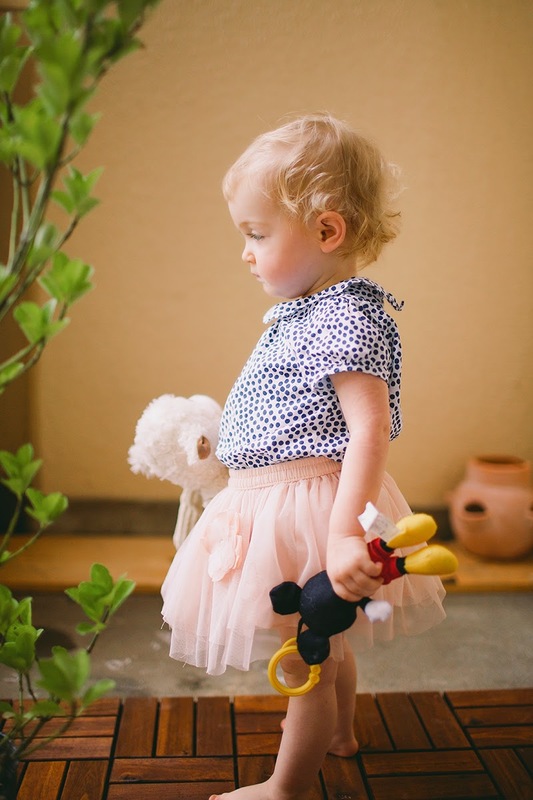 It is a tiny girl humming a handful of recognizable songs, fan girling over Mickey, her stuffed lamb, Lenny, a shoe obsession, and her constant plea to read. It is for a very patient toddler on miniature road trips and third-wheeling to many dates. Right now is for strong one-year-old emotions, and combatting them with an incredible ability to communicate, which I am so thankful for. Right now is for trips to the park, to the lake, and to the mountains. The sky usually completely covered with clouds. Right now, is for love and care being put into our bodies and into the food that we feed it. It is for simplifying. It is for cutting out the processed and the packaged. For minimizing the unnecessary chemicals, and channeling in on natural living. It is for putting our focus into flavorful vegetable dishes, mainly brussels sprouts because they are my favorite. It is for proper hydration and taking care of ourselves cellularly. Right now is for feeling better, sleeping better, living better than we ever have before. When we aren't eating plants and variations of brown rice and chicken, we are eating curry. Thai! Japanese! Indian! Most weekends are for frequenting our favorite privately-owned Indian place (just ten minutes from our home) conversing with the owner and his cook. They are from Nepal, and they are two of the kindest people we have ever met. Right now is for their unbelievable butter chicken curry, naan, and tandoori chicken. It is for being gifted mango lassi's and small treats for Anabel. It is them making faces at her trying their darnedest to get her to crack a smile. Right now is for the special opportunity to interact with not only the Japanese in this country, but people from different cultures and backgrounds that have made Japan their home too. Right now, in Japan, trees are just starting to turn from bright green to gold. Right now is for the streets that wrap around our home and outline the area we live in being just on the cusp of vibrance. Along with the shift of seasons is the change happening in my soul. It is for externally purging all the extra in my home and in my life. It is for really evaluating what's left inside of me and trying to better whatever, whoever, that is. It is for loving harder, forgiving with intention, and knowing who I am well enough that I do not have to worry about anything else. Right now is for chasing projects and hobbies, teaching 4 year olds at church, and building my business from the ground up. It is for strengthening my body and stretching deeper into yoga. It is for 5 day goals, and 5 month goals, and 5 year goals. It is for rediscovering who I want to be as a person, as a mother, and as a wife, and actively striving toward becoming that person. All in all, right now is for a whole lot of love and growth. It is for living well and eating well. It is for trying really hard to be thankful for the greatness in my life, and removing all that is not actively contributing to the person I want to be. What is your Right Now? Oh this post has inspired me so. But all your posts do. I may have to create one of these, starting with journaling it by hand. Also, your girl is the perfect combination of curls, long limbs, and sweetness. She is just a doll. Love this, and you. This post was such a pleasure to read! Beautiful like always! I really appreciate this post. It has me thinking about things that I need to change in my life. But for me, right now is about learning how to let go of expectations, without letting go of dreams and goals. I think a lot about five year goals, but not once have I considered five day or five month goals. Thank you for the inspiration to do so.